The first ever U.S. corrugated life cycle assessment has been completed by the Corrugated Packaging Alliance (CPA). To read the complete report or summary, visit the website. respond to customer and public requests for environmental information. The study intends to provide useful perspective for different stakeholder groups, such as the corrugated industry, consumers, retailers, packaging specifiers and buyers, waste recyclers, government agencies,non‐governmental organizations, LCA practitioners, and media. This study is not a comparative study in and of itself; however, it may enable future comparative studies. Other studies will need to employ a functional unit consistent with the goal and scope of this study, and can achieve specific results by scaling the input and output data appropriately. The scope of the study was to develop a “cradle‐to‐cradle” Life Cycle Assessment of the 2006 U.S. industry‐average corrugated product. • Paper mills drive the life‐cycle profiles – For all impact categories, material and energy flows from paper mills dominate the results. Environmental impacts are dominated by energy demands at the mill. Bio‐based energy (e.g. hog‐fuel, liquor, etc.) substantially reduces global warming potential (GWP) contribution from mills, but does not eliminate mills’ GWP contribution due to the use of fossil fuels. Energy sourcing is a management option that may be open to mill operators that can have a substantial effect on the environmental impacts. Increased use of biobased energy sources will further reduce the overall use of fossil energy and GWP impacts from mills, although there are numerous factors that must be considered in energy sourcing decisions (e.g. availability and price). • Transportation of final product does not define profile – Long‐distance transportation scenarios (based on national averages) were modeled yet still represented a minor influence on overall life‐cycle impacts for all impact categories. • End‐of‐Life is only important with respect to GWP – End‐of‐Life as modeled (based on 2006 industry average) demonstrates that it is only important in relation to global warming potential. Other life‐cycle impact indicators show little or no response from the End‐of‐Life stage. The End-of‐ Life effect on GWP is mainly related to methane generated but not captured from landfill operations. The sensitivity analysis on different End‐of‐Life management scenarios clearly shows that increasing recovery, increasing efforts to capture methane, or increasing the percentage of disposed corrugated materials that are incinerated for energy recovery have the potential to improve overall environmental performance. 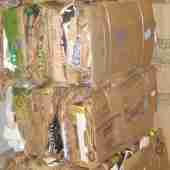 For more information, visit www.corrugated.org.